Lovers of Thank You, Mr. Falker and The Junkyard Wonders I bring tidings of joy. Patricia Polacco has written another one. Join her in a classroom in California where Trisha has finally come to love school. Her happiness rests on the shoulders of a remarkable teacher, Mr. Donovan, he of the Irish accent and bell-ringing laughter. There is always a smile on that man's face until the day he hands back Trisha's social studies test with a big F on the top. Mr. Donovan is one to accept a challenge. He's watching and thinking and noticing that Trisha has a hard time reading as fast as the other kids. He also notices that Trisha has exceptional artistic talent and gets her enrolled in a high school level art class where she meets the wondrous Miss Chew. Now , here's where the cool stuff happens. 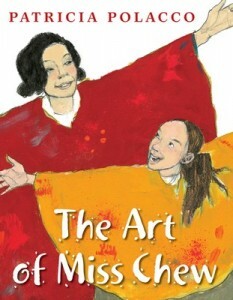 Miss Chew sees the world through the eye of an artist and it is Miss Chew who is able to see through Trisha's eyes and understand that Trisha sees patterns on the page when she reads...she sees the negative space around the words rather than the words themselves. What a discovery... a discovery that may help other children who have the great fortune to read this book. Mr. Donovan, meanwhile, has received bad news. His Da has passed away and he needs to go back to Ireland. A substitute, Mrs. Spaulding takes over Trisha's class and she has no tolerance for someone who cannot read as fast as the other students. There is no compassion in Spauldingville. (I think I had this teacher.) Trisha is back in the dark ages again with a teacher who denies her the possibility of success.